There are many places where you can share your faith with others. God provides so many opportunities to share your faith. You just have to be open to see those opportunities. I often spend time in the quiet corners of restaurants reading or studying. As a result, I usually have a chance to get to know some of the servers, and I seek to be an encouragement to them spiritually. Many times this leads to an opportunity to share your faith, to tell someone about Jesus, and to share the gospel with them. One of the questions I often ask them is, “When I think of you, how do you want me to pray for you?” This is a very affirming question because it tells them that I do think about them and that I am willing to invest in their lives by praying for them. But it isn’t invasive. I let them tell me how they would like me to pray for them. If they are not sure how to answer the question, I follow it up by asking, “What is a major point of stress in your life?” If they don’t want to share, that’s okay. But, most people know that I am sincere when I ask the question, so they usually share at a fairly deep level. For example, Penny said, “I just found out that I’m pregnant. We haven’t told anyone yet. I am thrilled but also scared. Many in my family have had miscarriages, and I’m afraid we may lose our baby. Please pray that the baby is healthy and goes to full term. ” She was not busy, and we were in a quiet corner, so I said, “Let me pray for you right now.” I did, and she was very grateful and seemed emotionally relieved. I never saw her again, but I know God put us together that day and that He was reaching out to her. 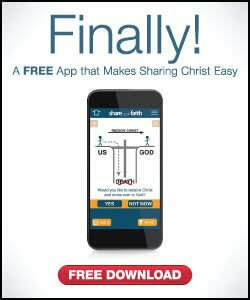 I have the Share Your Faith app on my phone, which is like a Christian tract for the digital age. 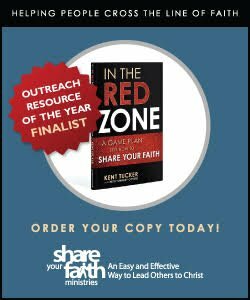 It is an evangelism resource that walks you through the steps of how to share Jesus and how to share the gospel effectively. While reading the Share Your Faith app on my phone with Linda, she prayed and received Christ into her heart. Linda then told me she was a junior at a state university but that she was very discouraged about school and may not finish. I encouraged her to ask God to help her to stay the course because getting her degree would open up more doors for a career path for her. I then prayed for her, asking God to heal and comfort her heart with the loss of her dad and for God to give her the strength to stay the course at school. I saw her again a couple of months later. She was so happy because she had finished the semester and got all A’s on her exams. She was beaming. I was proud of her and grateful to have been a part of her journey. When I asked Jean, another server, how I could pray for her, she said her husband had just told her that he no longer wanted to be married to her. Then she said, “But I’m not leaving.” I prayed for her and helped her find a really good Christian counselor. She focused on getting close to God and forgiving, loving, and serving her husband and disarming him by her kind responses. I see her and pray for her often at the restaurant. A year later, Jean and her husband are still together and beginning to enjoy their relationship with each other. God will provide you with opportunities to share your faith with others. You never know where people are on their spiritual journey unless you ask. The question I have found most helpful is, “When I think of you, how do you want me to pray for you?” How they respond usually gives me an opportunity to share Jesus with them and be an encouragement to them. I encourage you to use the Share Your Faith app. 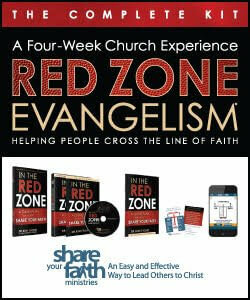 It’s an effective evangelism tool that will guide you on how to share the gospel and how to share Jesus with others.